A new year has arrived! Everyone always seems to stress looking ahead as the new year begins. When I begin something new, I find that looking back can often be helpful. Reflection allows me to learn lessons, and frame my perspective as I plan for what lies ahead. Before this year’s classes begin, I have a little time to pause and reflect. As I look back, I realize that last year reinforced the importance of playing around and experimenting in my artwork. Exploring new art techniques can yield wonderful surprises. Last year at this time, I was experimenting with a variety of batik techniques. What is batik? It’s a fancy name for wax resist in combination with dye. In this case, the dye is watercolor. Playing around with batik was a new year’s promise to myself in 2016. These batik techniques made their way into my work and my classes in 2016. As I look back on the year, learning more about batik was a really great use of my time and energy. Perhaps you’ve never tried batik, or perhaps you’re wondering just what goes into creating a batik painting? Sharing a free little lesson with you seems like a nice way to begin this new year, so here you go…Happy New Year! 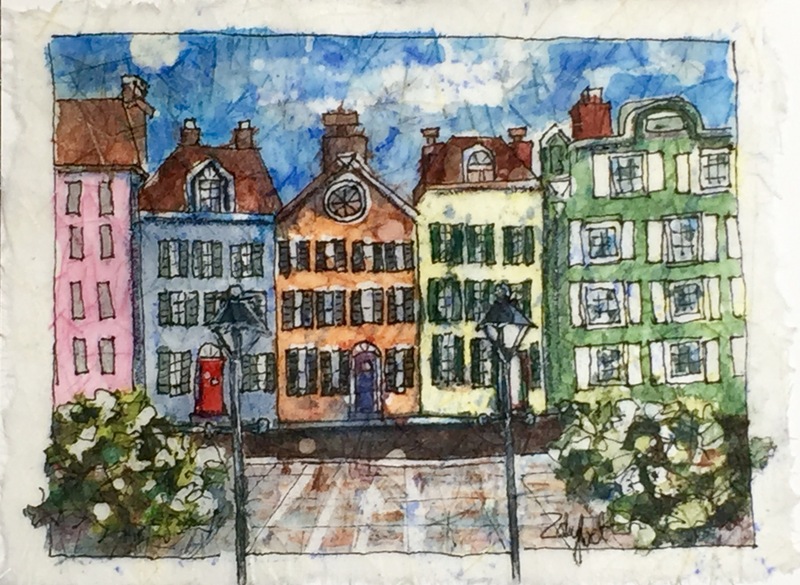 This little batik painting of Charleston is one I’ve loved from the moment it was finished. It’s painted with watercolor on rice paper (aka washi paper) using wax as a resist. This is a good example of watercolor batik. Playing with wax and watercolor is a fun alternative to traditional watercolor painting. The warm wax is soothing, especially on cool winter days, and the rice paper surface helps creates unexpected surprises that are only obtainable using this method. 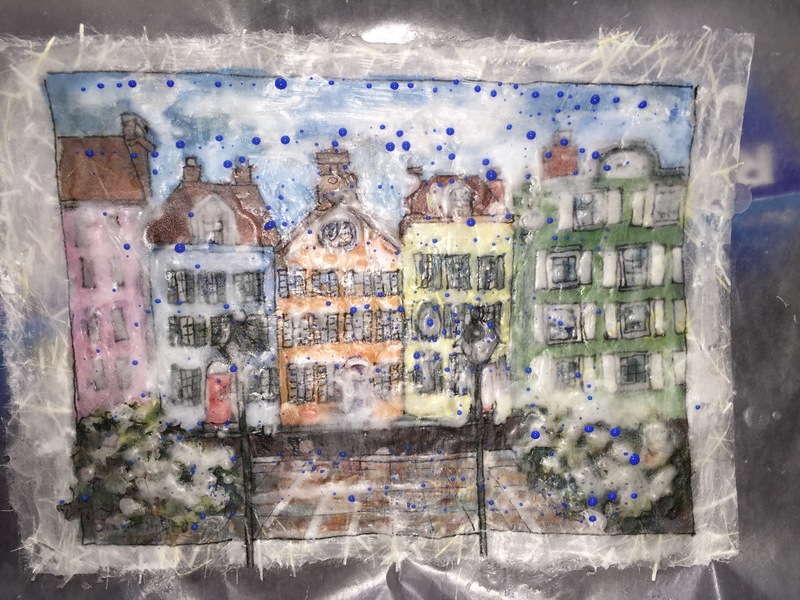 Painting with wax as resist is similar to using masking fluid and painting in layers. When painting with wax resist it’s necessary to begin with a plan. 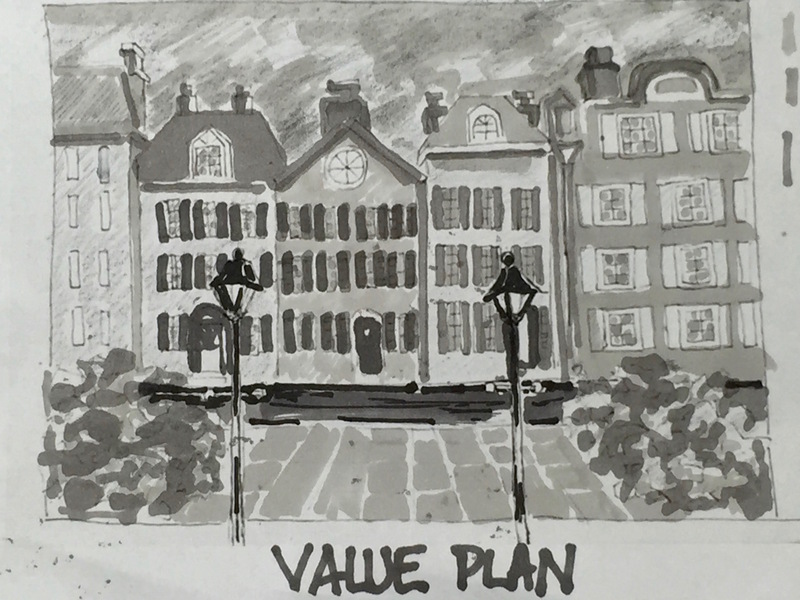 The plan must assess the desired VALUES in your painting, and work strategically from light to dark. Working from light to dark is very traditional in watercolor. It means that the light or white values must be spared. You do this by painting around them. This is called negative painting. However to make that negative painting easier, you can MASK the lights you want to paint around. When the light values are protected with masking, it makes the painting much less tedious, and in my opinion, it makes it more fun! That’s never a bad thing! However, using traditional masking fluid on watercolor paper is often a problem. Masking fluid leaves very crisp and often ugly edged shapes. The harsh quality of the edge that masking fluid leaves behind always creates the need to soften edges once the masking fluid is removed. In my opinion, this is where wax used on rice paper has a huge advantage! There’s a softness to the result that masking on regular watercolor paper can’t achieve. 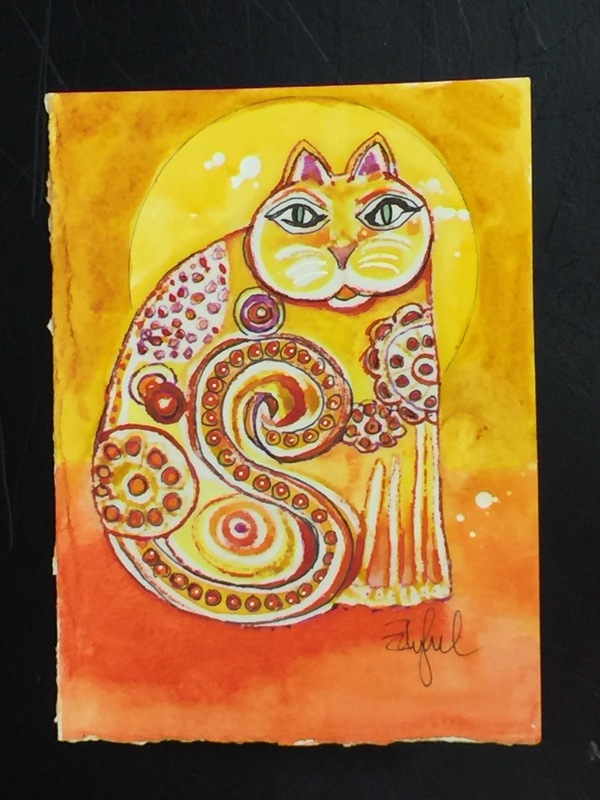 My friend and teacher extraordinaire, Kathie George, has many beautiful lessons that she sells on her website for those interested in purchasing a pre-packaged batik lesson. You can check her out on Kathiegeorge.com. However, if you are wondering how to create your OWN batik plan, this requires some understanding of the process, and some thought. 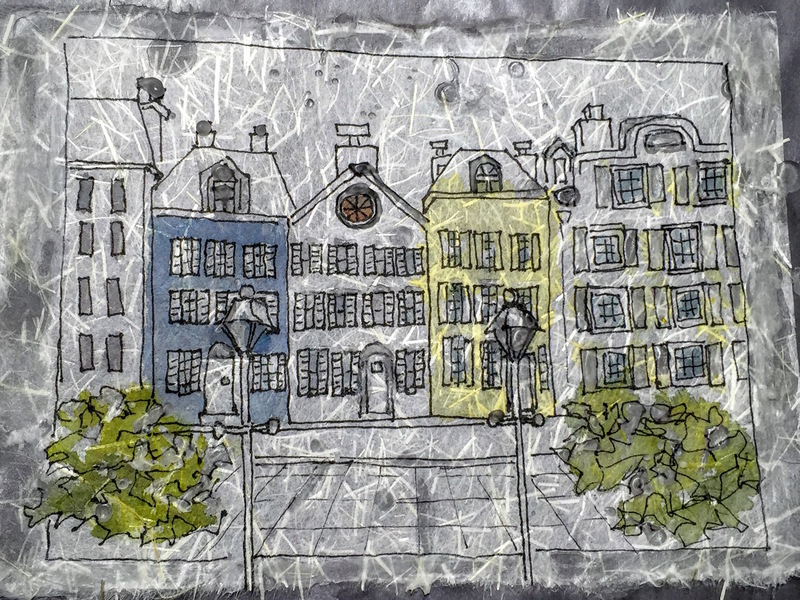 I’m going to walk you through the steps I used to create the batik shown above. It’s not rocket science, but if you pay attention to the method, you may find inspiration for your own exploration of batik! Step 1 is to make a line drawing of your subject. Next you take warm wax and paint the wax on all the white values in your painting. For this painting, I also waxed around the outside to create a white border. Additionally, I like to spatter a bit of wax at each layer along the way. This exaggerates the batik effect for me. You can order the wax I used here via this link: Batik Wax- Amazon link. Remember that heating wax must be controlled and temperatures should be below 190 degrees to avoid creating toxic fumes. I use a fry pan with thermostat and a candy thermometer. I also use old natural bristle brushes. Once a brush is dipped in wax, it can’t be used for other purposes afterward. After the whites are waxed, you can take your watercolors and paint the lightest values. Don’t worry if your paint escapes the boundaries of your shapes, because it will. Rice paper is not sized, and so the paint expands easily. It won’t be a problem, so long as you take the time to soften the edges of your paint shapes. Soft edges will disappear beneath subsequent layers of paint. Dry this layer and then wax those lightest values. The next step is to paint your light middle values. Drying and waxing in layers. This allows you to continue to build depth of color. Once you’ve got all your values in place, you then wax the entire surface of your painting! Yup, everything! The final steps are the crazy part of batik. Once the entire surface is covered with wax, let it dry. Then crumple it into a ball that allows cracks to form in the surface. Try not to crack it in such a way that pieces of wax fall off. But these cracks are important. At this point, you need to pick a color that might be used to unite your painting. In this case, I chose Cobalt Blue. Take that color and paint it over the entire surface with a flat brush. Wiggle it into those cracks and allow beads to form as in the photo above. Those beads will create some batik magic! Cover those beads of color with a final coat of wax, and you will be ready for the final step. IRONING! Get some newsprint or newspaper and your hot iron. Place the painting between multiple layers of paper and iron the wax out of it. You’ll need to change papers, but the wax will come off and the paint will embed itself into the rice paper. It’s MAGIC! All those unpainted areas you waxed will reveal themselves as white. You can even go in at this point with more watercolor and touch up mistakes with more paint. Pastel pencils are also fun to use for finishing, but be careful! Their hard tips will tear the delicate paper if you’re not careful. The small painting above is an easy piece to begin with. 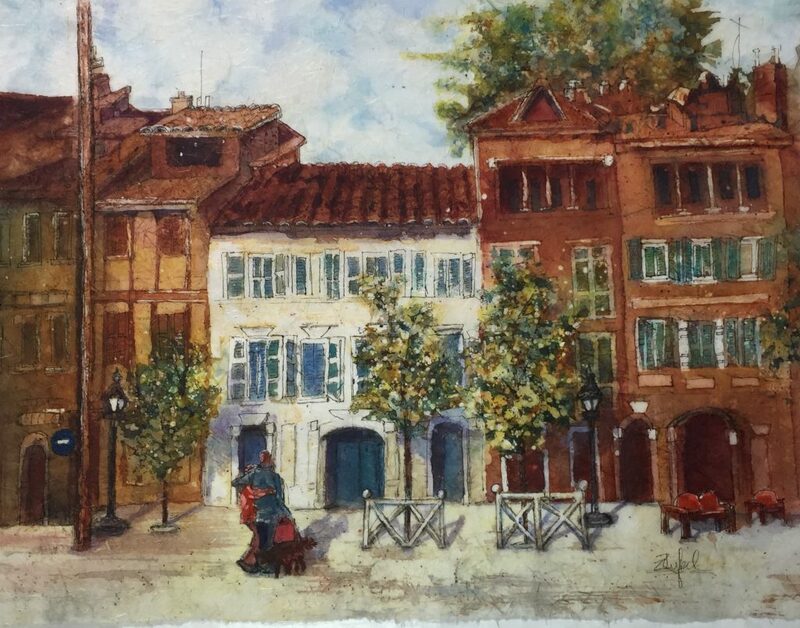 I took the technique to a larger format and used batik to interpret a painting I did while on location in Europe. 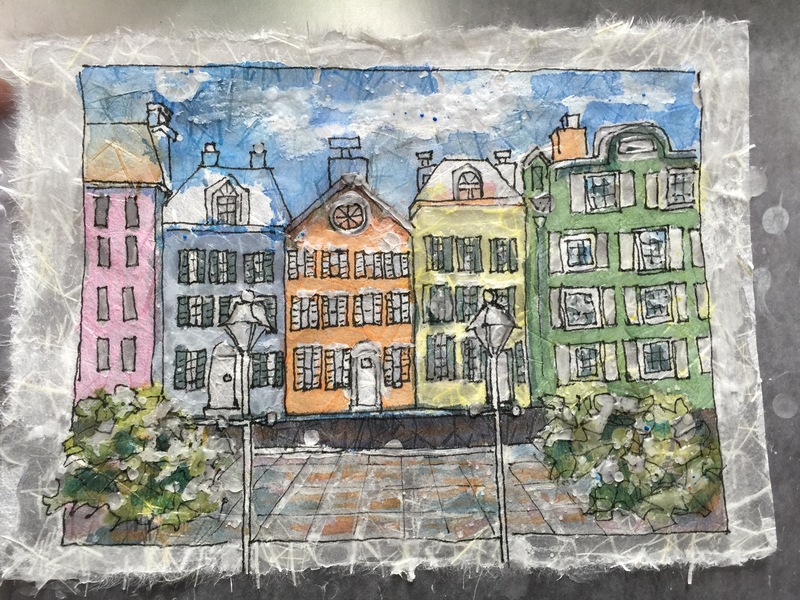 The batik shown below, won an award in the 2016 South Carolina Watermedia Society Show and is currently touring the state as part of the SCWS traveling exhibition. What a nice outcome of just playing around. It’s exciting to have my little experiment be so well received! This painting is available for purchase if you’re interested. I hope this inspires you to try something new this year! I love sharing what I learn along the way with those of you who study with me or subscribe to my blog. If you like what you read, please consider sharing it with friends on social media. 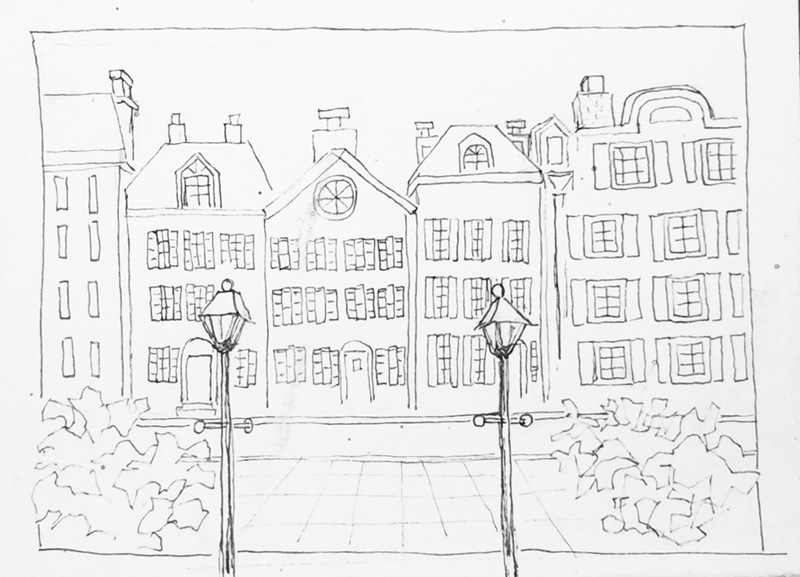 You could also give a review of my classes on my Facebook page- Rebecca Z Artist and Art Classes (https://www.facebook.com/rebecccazartist/). All these things help me in real and tangible ways. I’ve got more great lessons and art adventures coming your way in 2017. Can’t wait to share the journey with each of you! Patricia, thanks for all those happy emoticons and the sweet sentiments that go along with them! Have you ever tried batik? Are you experimenting with anything creatively these days? I’d love to know more about your creative path… ?‍❤️‍?‍?